Bariloche Argentina is the gateway to Patagonia and is an ideal starting point for a 2 week Patagonia itinerary. Flights to Bariloche run regularly from Buenos Aires. We traveled to Bariloche in November (South Hemisphere Spring) as part of an extended trip to South America (#DrJSabbatical). 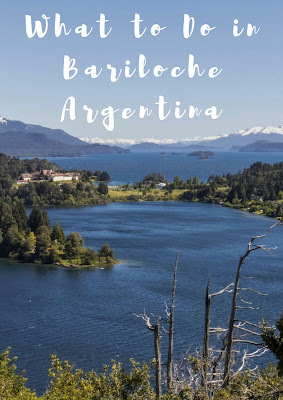 Read on to learn about what to do in Bariloche including some day trip options if you hire a car. 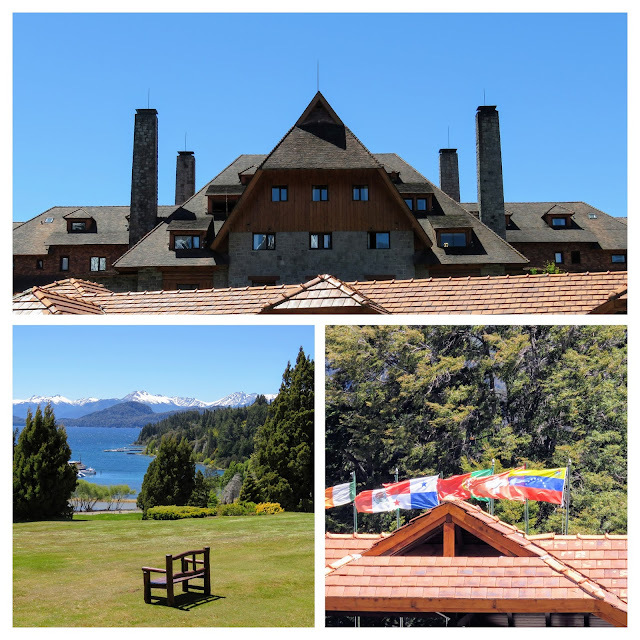 We stayed at Alma del Lagos Suites and Spa, a hotel nestled right up against Bariloche's main attraction: Nahuel Huapi Lake. We splurged on a room with a lake view that cost about 115 EUR per night at the time of writing. One of my favorite things to do in Bariloche was to leave the window blinds open a crack so we'd wake up as the sun came up. 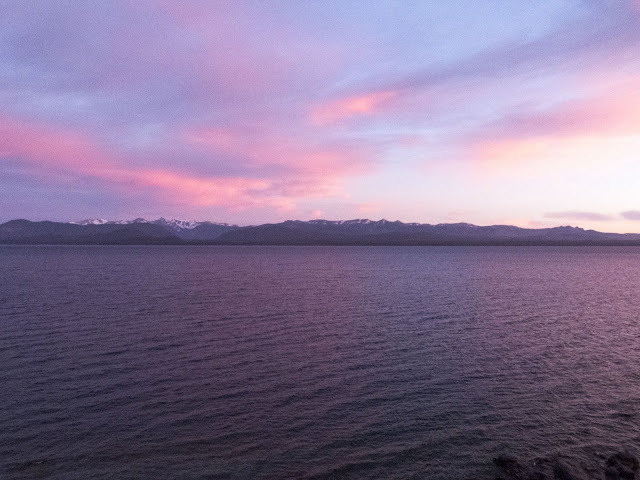 The sunrises over Nahuel Huapi Lake were simply breathtaking. We didn't even have to get dressed to experience the Argentinian Lake District sunrise in all its glory. Alma del Lagos Suites and Spa was situated about a 15 minute walk from the center of Bariloche and was positioned right on the road that led to all the awesome day trips nearby. We were definitely pleased with our choice of hotel. We took a walk to get our bearings when we arrived. What is there to do in Bariloche? The first order of business was to satisfy our sweet tooth. We passed Helados Jauja and stopped in for a refreshing ice cream cone. There were dozens of flavors to choose from. Bariloche is known as the Switzerland of Argentina. I could immediately see why since there were chocolate shops on nearly every corner. We stopped into El Reino de los Chocolates (The King of Chocolates), an ideal place to pick up some souvenirs to take home for friends and family. Because there was so much competition between different chocolate shops, the staff was giving out plenty of free samples. Manush Beer Pub is a good choice for craft beer and comfort food. There were a surprising number of craft beer pubs in Bariloche including Cervecería Bachmann, Antares, and Wesley Brewery. All the local beer places were crowded so expect to wait for a table if you don't go early. 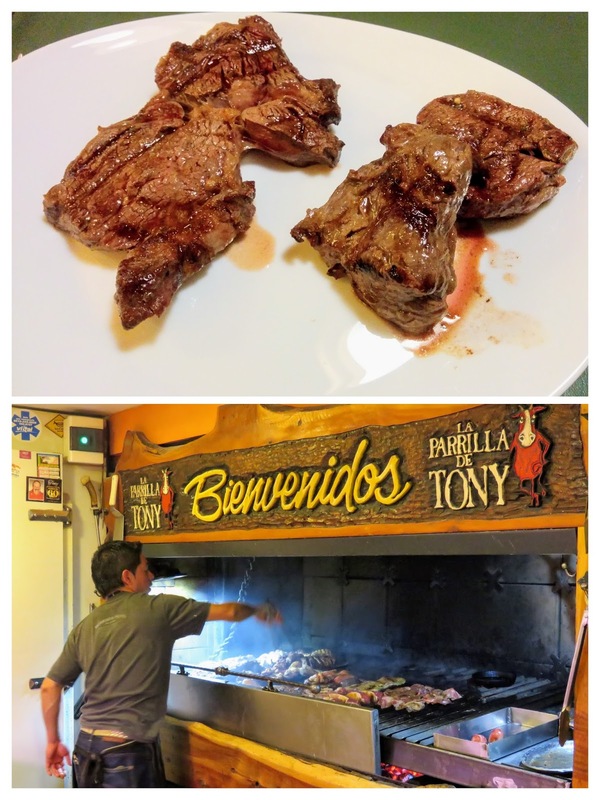 Of course, Argentina is known for parrillas grilling up juicy steaks and other meat dishes. 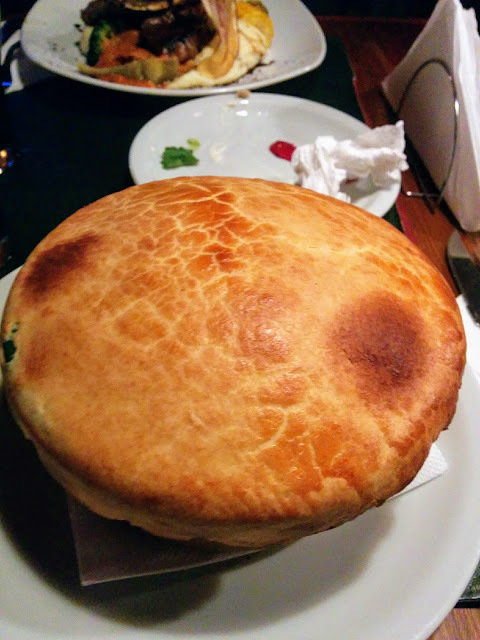 In Bariloche, you absolutely must go to La Parrilla de Tony. You can see all the action happening at the grill from the tables from seasoning the meat to cooking it to perfection. At one point, a large, jolly-looking man walked into the restaurant and I thought: "could that be Tony?!". Sure enough, he went up to the parrilla and started prepping steaks. I went up to get a closer look and perhaps take a picture. One of the waiters motioned for me to hand him my camera and handed me a giant knife. Next thing you know, I was posing for a photo with Tony himself at the parrilla! The portions at Tony's were huge but the steak went down well with Lagarde Malbec, a bottle of Argentina's signature varietal. Tony's was so good we ate there twice. Tony himself was only there the first time though. There are a variety of day trips from Bariloche that are worth including on your itinerary if you have a car. In fact, I do strongly recommend getting a car since it makes getting around to see the amazing scenery of Argentina's Lake District that much easier and faster. 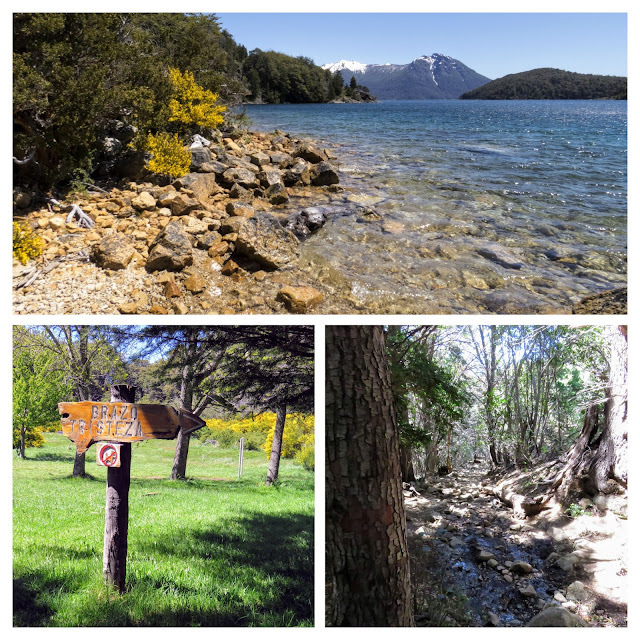 We took a self-drive around Circuito Chico near Bariloche. This road trip takes about a half day to complete. It was so windy at first when we stopped at various viewpoints along the route that I thought we'd get blown away. 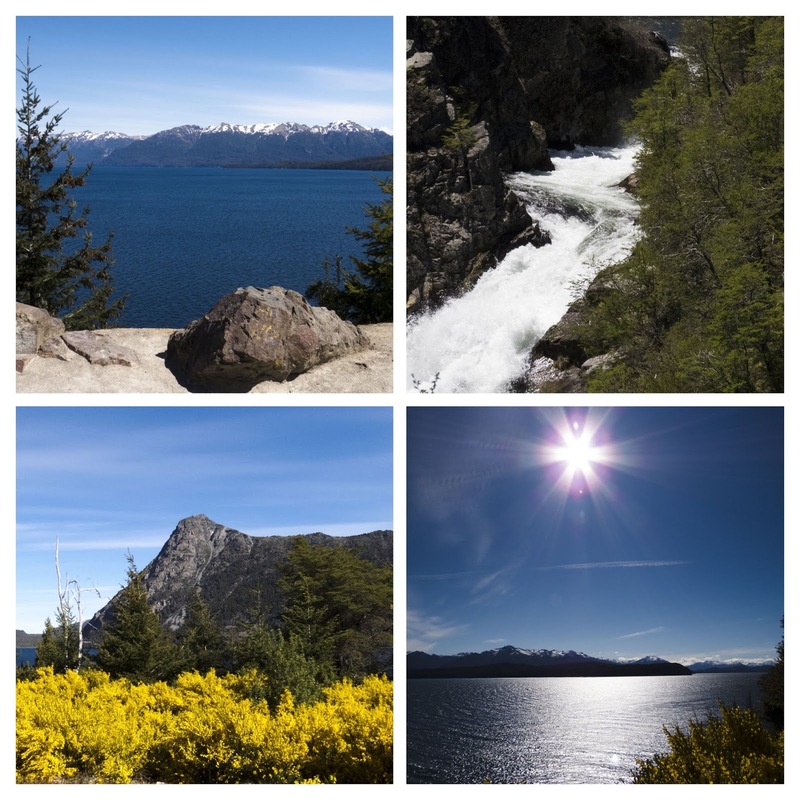 Circuito Chico features some great photo spots alongside and above Nahuel Huapi Lake. Pull over wherever the view catches your fancy. We picked up a map of various drives that you can take from the tourist office in Bariloche. We spotted Mirador Braza Tristeza on the map and decided that it looked like a promising spot to stop for amazing views over the lake. Mirador Braza Tristeza turned out to be incredibly hard to find. We had to pull onto the road for Hotel Alún Nehuén (not obvious from the tourist map). There is a public parking lot here for access to the lake. Finding the trail to Mirador Braza Tristeza was difficult as well. It turns out that you have to head from the parking lot toward the forest and then you'll encounter a small sign pointing the way. Cross a rickety bridge to access the trail. We walked for about half an hour, fording a couple of small streams along the way. We ended up bailing out of the hike early before we got to the viewpoint. At one point, the signage on the trail pointed up a steep hill away from the lake. We opted to take the low trail along the lake and were rewarded with stunning views of the crystal clear water and mountains beyond. That was enough for us. Continuing our day trip from Bariloche along Circuito Chico, we stopped for lunch at the famous Llao Llao Hotel. The hotel is gated and a little snooty if I'm honest. We pulled up to the security gate and told them we wanted to have lunch. They actually had to call the restaurant to confirm if they had room before allowing us in to park the car. We secured a reservation at Cafe Patagonia which was nearly empty when we walked inside. As you can imagine, they don't get very much foot traffic. 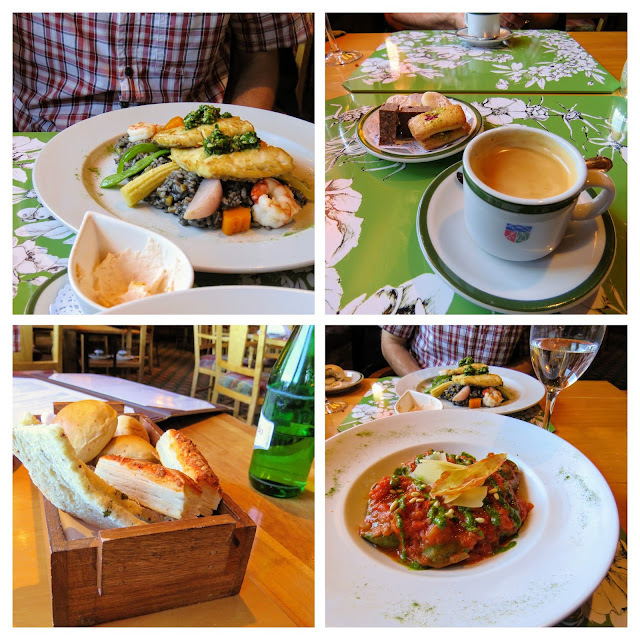 The food at Cafe Patagonia was really good and the views were fantastic but the meal was quite expensive. Returning from our day trip on Circuito Chico, we made a detour to Telerifico Cerro Otto. There are a number of hills surrounding Bariloche with cable cars or chairlifts leading to the top. The ride to the top in the cable car is quite expensive at 450 Argentinian pesos (about $22 USD at the time of writing). We figured that you only live once though, forked over the money, and boarded the cable car. I'm a bit afraid of heights and I can tell you that the ride on Telerifico Cerro Otto was mildly terrifying. The ride lasts less than 10 minutes but it's incredibly steep and you'll be buffeted about by the wind on occasion. The ride was totally worth it in the end for the sweeping views that we got over Bariloche and Nahuel Huapi Lake. We discovered a bird of prey sitting at a Christian shrine which had been set up near the upper entrance to the cable car. I can see how you might want to say a prayer if you are so inclined before boarding the slightly sketchy cable car for the ride back to sea level. 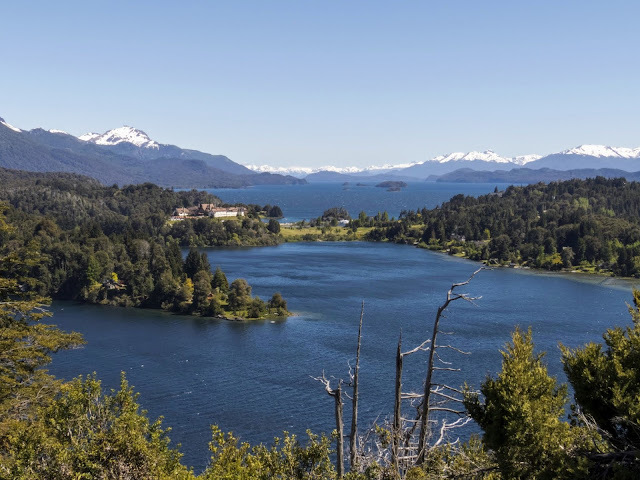 Ruta de Siete Lagos is another great drive that you can do from Bariloche. It's a little far to do an entire round trip in a day without feeling rushed. We drove straight through from Bariloche to Villa La Angostura which took about an hour and a half. We spent about an hour in Villa La Angostura and left wishing we'd had more time in this quaint Argentinian town. Highlights include some awesome chocolate shops like Mamuschka. You can also get Mamuschka chocolates in Bariloche but that location is generally overrun with tourists while the Villa La Angostura outlet is much quieter. We also sampled some creamy slabs of Argentinian chocolate from La Campiña Del Sur in Villa La Angostura. Public service announcement: Make sure you take time to use the bathroom somewhere in Villa La Angostura. We did not see any public restrooms or even anyplace you could stop and buy something in order to use the loo anywhere along the Seven Lakes Drive. Even in Villa La Angostura, it's difficult to find a toilet. We stopped in Cafe Antibes for a light bite in both directions on our drive. Their ham and cheese medialunas are yummy. Cafe Antibes has a nice toilet facility that customers can use. The landscape gets even more picturesque as you continue along Ruta de Siete Lagos. We drove to waterfall Vullignanco and then decided to turn around and head back to Bariloche to ensure that we completed the trip before dark. We saw tons of scenic spots along the way. There are small parking lots near many of the most beautiful places but even if there isn't one near a point of interest, just pull off at the side of the road to check out the views. The traffic was really light when we drove the Ruta de Siete Lagos. Now, Ruta de Siete Lagos translates to Seven Lakes Route. There were really about 10 lakes along the route. We saw about seven before turning around. Bariloche anchors Argentina's Lake District and we highly recommend getting out on the water. We signed up for a Cau Cau boat cruise on Nahuel Huapi Lake. 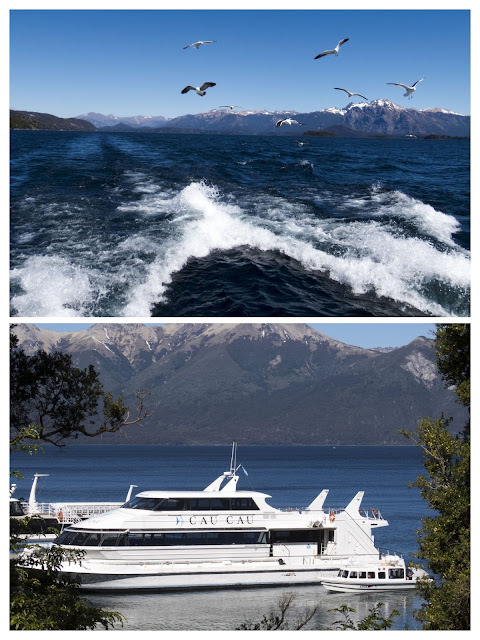 We visited Bariloche in Austral Spring which is considered the low season so we got a discounted rate on the half-day lake cruise ($1060 ARS per person which was about $50 USD at the time of writing). Visitors also need to pay an additional $250 ARS (foreigner price; about $12 USD) for entry into the national park. In addition, we splurged on the VIP package for an extra $440 ARS (about $20 USD) which included wine, beer, sandwiches, and sweets. The package included a private cabin for VIP guests on the upper deck of the boat but the outdoor area was shared with the guests from below. The passengers had a grand old time feeding the hungry flock of gulls that seemed to follow our boat along the way. Some of the birds were even eating out of people's hands. No wonder there were so many, they associate the daily passage of the boat as providing an easy meal. We didn't partake in those shenanigans. You can read more about places to see the birds of Patagonia in a more natural setting here. Out of the hundred or so people on our Cau Cau cruise, there were only five English speakers. We took a tour of Isla Victoria with Sebastian at our first port of call. 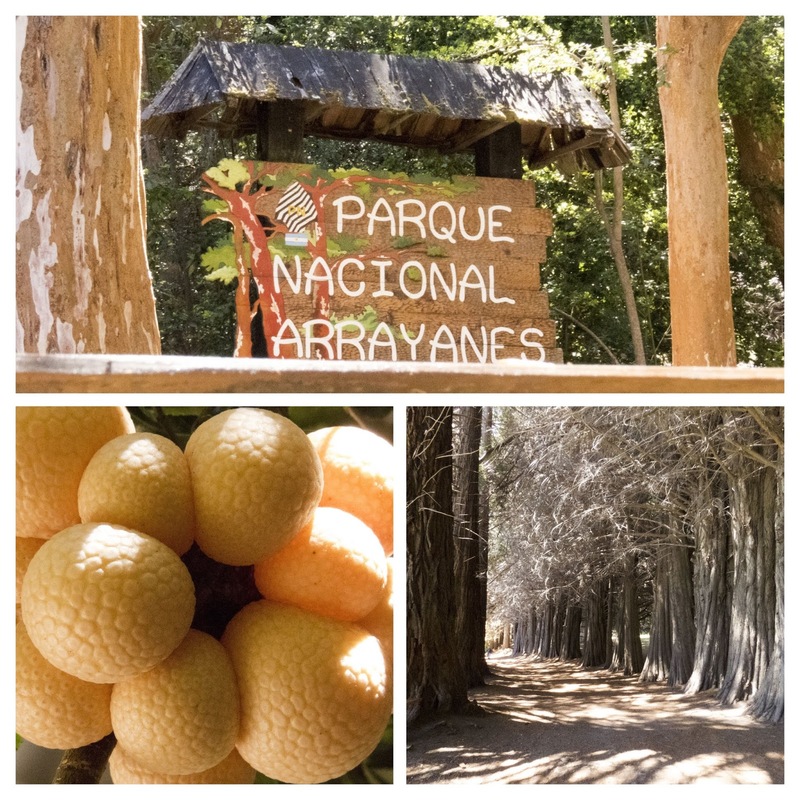 Our second stop was Parque Nacional Arrayanes. Sebastian advised that we should wait for the crowd to clear on the boardwalk through the forest before setting out on the loop trail. We decided to do the opposite and rushed off the boat when it docked to get a head start on the crowd. I'm glad we did because another boat rocked up soon after we did so the trail never really did quiet down. A German couple (2 of the 5 English speakers who I mentioned previously) took Sebastian's advice and ended up missing out on the hike. Follow your instincts when it comes to crowd avoidance! We found that it was essential to hire a car in Bariloche. Bariloche is lovely but many of the scenic attractions are outside the town limits. We found that figuring out the speed limits on roads in Argentina was difficult. There are signs when the speed limit decreases but not when the limit goes back up again. 100 kph seemed like a reasonable speed in the absence of signage. Also, when driving in Argentina, turn your lights on at all times, even at high noon when the sun is shining. We encountered a couple of police checkpoints on our drives where they were checking for lights. 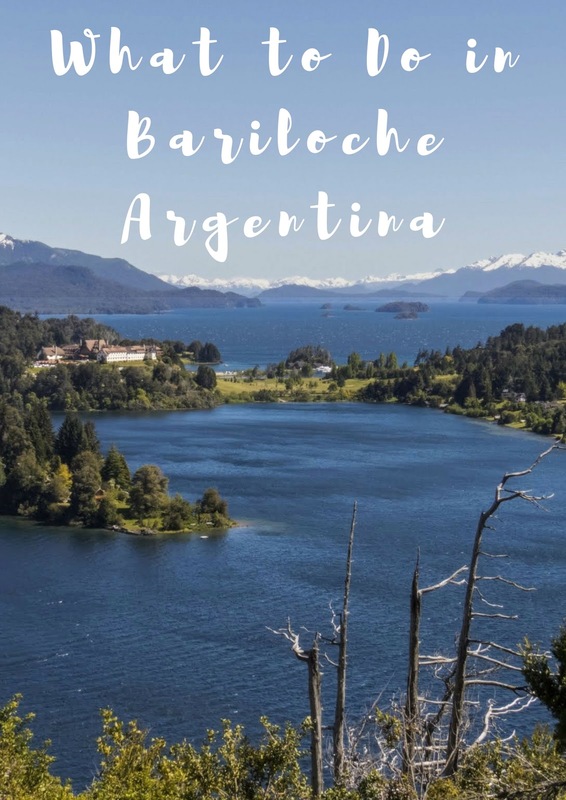 Is Bariloche Worth Visiting on a Trip to Argentina? So, is Bariloche worth visiting? If you like amazing scenery and gorgeous vistas, Bariloche is a must-see stop on a trip to Argentinian Patagonia. You simply can't beat the stunning blue water; bluer than anything I've seen before in my life. Combine that with great Argentinian steaks, wine, chocolate, and craft beer and you've got the makings of a great trip. 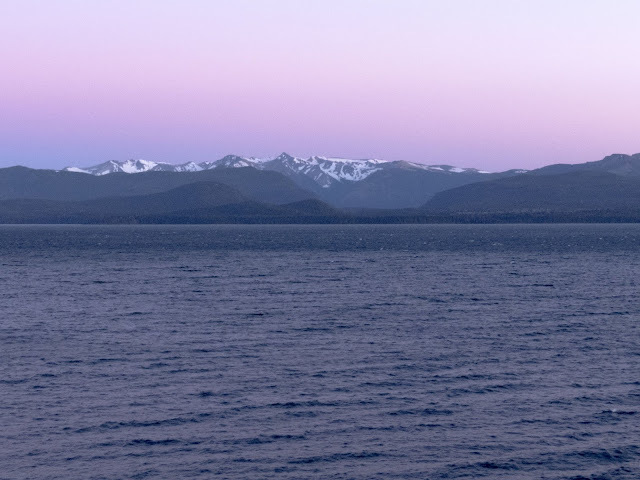 Read about what to do in Bariloche Argentina and map out some self-drive day trips. Find out about things to do near Bariloche by car.